We'll be happy to send you more information about attractions, activities and lodging in the Franklin / Nantahala area of Western North Carolina. "How many days in a week?" 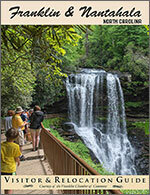 Download your copy of the Official Nantahala & Franklin North Carolina Visitor Guide. This special online version has all the latest vacation information! The file requires Adobe Acrobat Reader, and is 16MB in size. You can also request a printed copy of the current Visitor Guide by calling 877-524-2583 or filling out the information request form to the left.